Aaron Cortes serves as the Director of the STEM initiatives at the Center for College Access and Success of Northeastern Illinois University. In this capacity, he directs the TRIO Upward Bound, TRIO Upward Bound Math and Science and 21st Century Community of Learning Centers. 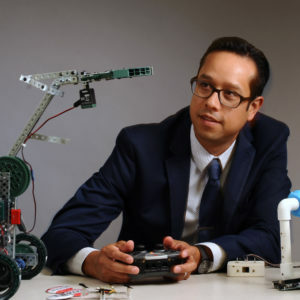 Mr. Cortes also supports the development and implementation of STEM/STEAM programming for students, teachers, educators and administrators across the University programs such as GEAR UP, Center Space (Maker Space), Computer Science Department, and Department of Education. In addition, Mr. Cortes also engages in collaborative work with the U.S. Department of Agriculture Kika De la Garza Fellowship, Khan Academy Ambassador program, SAEOPP Center Priority Training, Chicago STEM Pathways Cooperative, the Asia-Pacific Economic Cooperation as STEM Specialist, Virtual Educa/EducaSTEAM of the Organization of American States and the collaborator of the Pan American Development Foundation.